« Second Edition of DenkWerkStadt! NUCLEUS Welcomes Citizens and Scientists to a Festival of Inspiration and Creativity! Rhine-Waal University is right in the midst of preparing a major highlight of its Embedded Nucleus. The first „Rhein-Waal Mini Maker Faire“ will take place on Saturday, April 13 on HSRW Campus in Kamp-Lintfort. Visitors from all over the region will encounter exciting inventions, inspiring hands-on experiments, interactive workshops and lots of fun with mindblowing ideas around green technologies, nature, environment and sustainability, urban gardening and upcycling. The first Maker Faire in the Lower-Rhine Region region will bring together curious visitors and creative “Makers” from universities, NGOs, SMEs and cutural backgrounds. Within NUCLEUS, the Mini Maker Faire was developed to nurture and support new forms of transdisciplinary research between partners inside and outside academia. During the Maker Faire external stakeholders such as NGOs, citizens or teachers will have the opportunity to get in touch and co-create with researchers and innovators. Being a „Green Edition“ the Mini Maker Faire will create links between the university and the upcoming Federal State Gardening Exhibition, opening in 2020. The Mini Maker Faire will be part of the Embedded Nucleus at Rhine-Waal University. 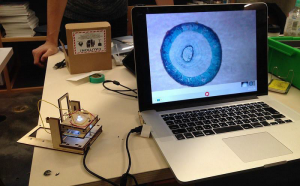 At the same time it will present a very special Mobile Nucleus Event: A „DIY Microscopy Workshop“: In this workshop teams of 3 – 4 participants will transform ordinary webcams into optical microscopes. This will enable them to explore the world of microbes. The „makers“ will bring their star to the show: Euglena gracilis. A microbe that is able to propel itself through the water and is light sensitive. Participants will use their mobile phone to interact with and view this tiny bug. The participants will learn how to take a webcam apart and get to know the inner parts. Next they will understand how lenses and magnification work. By assembling laser cut parts they will build their own microscope. After learning how to prepare microscope slides, they will be able to explore the world of microbes, including mobile Euglena and taking a look at their own DNA in cheek swaps. Pieter van Boheemen is a research and maker, and one of the co-founders of the Nutshell Biohub in The Hague. 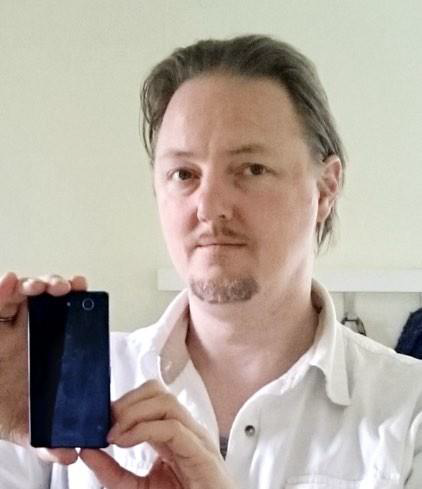 He frequently gives talks and conducts workshops that intersect biology and technology. 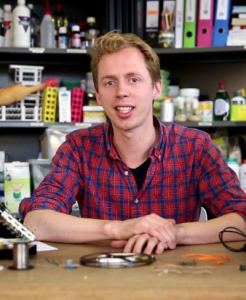 As the initiatior of the Dutch DIYBio community and previously as manager of Waag Society’s Open Wetlab, Fablab and Textile Lab he has many tricks up his sleeve. Jan-Maarten Luursema is a researcher at the Radboud University Medical Center in Nijmegen where he brings a maker’s perspective to surgical training. He has a background in the Visual Arts, Medical Art, and Cognitive Psychology. The Open Wetlab of de Waag helped him turn his fascination with biology into practice, which now includes developing tools to study microecology. He co-founded Nutshell Biohub in The Hague.